What do you think about using light over fish ponds to attract insects at night? Those that fall into the pond the fish would eat. Isn’t that cheap protein? That's a good idea, fish farmers should try it and tell us the outcome. I’d used a bug zapper to kill the insects so they're less likely to escape. That’s really cheap protein. It will also help to eliminate biting insects like mosquitoes. (06-13-2015, 02:26 AM)Manger Wrote: I’d used a bug zapper to kill the insects so they're less likely to escape. That’s really cheap protein. It will also help to eliminate biting insects like mosquitoes. According to Wikipedia, a study among 13,798 insects killed by a bug zapper, only 31 were biting insects. To kill biting insects like mosquito, only specially designed bug zapper can be used, the ones that attract mosquitoes with carbon dioxide. Seems like the bad guys are tricky. Is there any poisonous insect that can kill fish? If so this might not be a very good idea. Jesus! How many kg is that and how many years? There is no need for an expensive bug zapper. 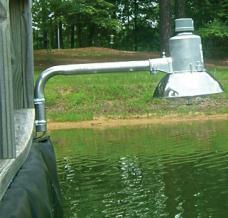 It will be cheaper to suspend light above the pond water. Attracted insects will fall into the water and the fish will eat them. Insects are very harphazard in the way they fly, so most of them will likely end up in the pond. (12-08-2017, 09:47 AM)Hunter Wrote: There is no need for an expensive bug zapper. It will be cheaper to suspend light above the pond water. Attracted insects will fall into the water and the fish will eat them. Insects are very harphazard in the way they fly, so most of them will likely end up in the pond. Nice idea. But one must be very careful to secure the wire well. If it fall inside the pond, all the fish will die. (12-08-2017, 09:51 AM)Manger Wrote: Nice idea. But one must be very careful to secure the wire well. If it fall inside the pond, all the fish will die. True. You may also use low-voltage battery to power LED lights.